We're smack dab in the middle of week 29 in Jen's pregnancy. You know what that means! Can you feel it? Can you smell the absurdity hanging in the air? That's right, it's time to compare the size of our unborn children to produce as selected by a website which may or may not have any concept of what different produce actually looks like! 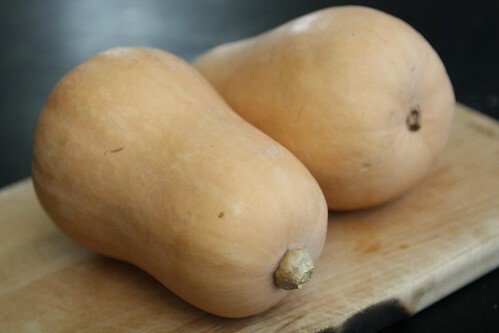 Week 29 means that the babies are the size of . . .
. . . butternut squash! It's actually pretty annoying that the larger vegetables are all fall vegetables. If we'd had any foresight we would have planned on having the babies born sometime in December. That way it would have followed these bogus baby size charts much more closely. As it was another lovely evening I loaded up our Rubbermaid tub with all the essential dinner ingredients and walked it behind the apartment to set up for dinner. 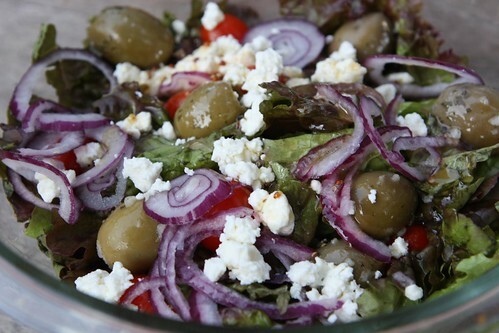 I made this salad with red leaf lettuce, red onion, grape tomatoes, feta cheese, lemon garlic olives, and some mustard vinaigrette that Jen had made. I peeled and thinly sliced the butternut squash and grilled it with olive oil, salt, pepper, and chili powder. 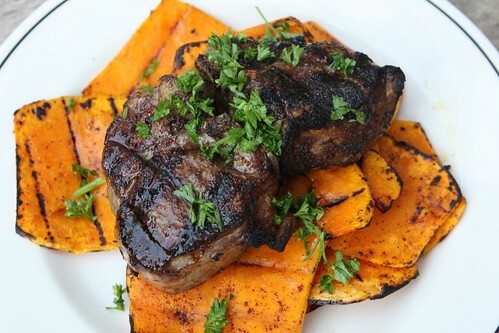 I also grilled some lightly seasoned lamb loin chops and served them on the top. 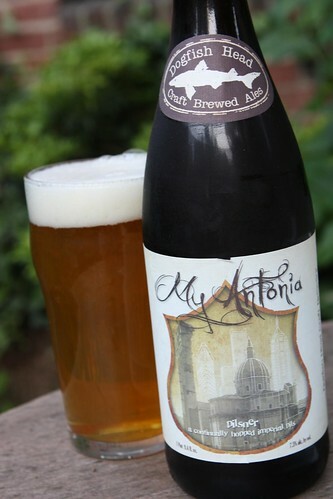 For beer I chose this My Antonia by Dogfish Head from the beer cellar. This was a really nice pilsner and went down nicely with some grilled lamb. This beer features one of my all time favorite Dogfish Head Quick Sip Clips where Sam Calagione smuggles some of this beer in to his grandmother's nursing home so she can taste it. It really makes me wish I'd thought of smuggling some home brew in to either of my grandmothers when I went to visit them. It would have been great. Kids, don't miss out on this opportunity. Smuggle beer into your grandmothers' nursing homes and get them liquored up. It's the right thing to do.